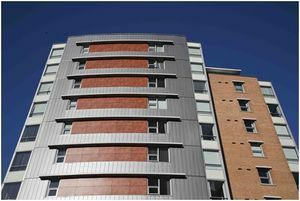 Built in 1986, the first MCC SHS Housing Community, Charleswood Court, offers 26 units of low end of market rent apartments for families and singles. More Than A Roof Mennonite Housing Society (MTR) develops and manages inclusive communities of affordable housing for individuals and families in British Columbia affected by low income. Founded in 1984 as an affiliate of Mennonite Central Committee (MCC) British Columbia, More Than A Roof started when a group of business colleagues called a meeting to discuss their concerns around the growing problems of poverty and homelessness in British Columbia. Out of this meeting came the decision to form a housing society. The founding members of the original executive committee were Siegfried Bartel, David Giesbrecht, John Redekop, Walter Martens, Jake Sawatzky, and Elizabeth Balzer. Known initially as MCC Social Housing Society, it became the first Mennonite based housing provider in British Columbia. In 2003 the society was granted independent status from MCC BC and the name More Than A Roof Mennonite Housing Society was created. Between 1984 and 1998 More Than A Roof developed four low-income, family housing communities in the areas of East Vancouver, Steveston, Prince George and Burnaby. In 2006 the society took over management of two more family complexes in Maple Ridge and Victoria, adding another 64 units of affordable housing to their portfolio. 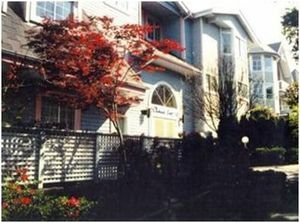 In 1992 MTR Housing ventured into housing based health care by partnering with Fraser Health, a branch of the provincial government, to manage nearly 100 units of supportive mental health housing in North Vancouver. Then in 2002 they opened Candela Place with 63 units for low income urban singles with 20 units designated for those with chronic or severe mental health who are supported by a full-time mental health worker, offering six wheelchair accessible units. In 2009 MTR opened its doors to another 86 single occupancy units called Kindred Place in Yaletown, which offered 30 units of addiction recovery support services with a full-time support worker. Under the province of British Columbia’s Provincial Homelessness Initiative, this model was repeated in 2010 at Karis Place, offering an additional 105 units for singles, again in Yaletown, with 30 units dedicated to those seeking addiction recovery support services. Both buildings have seven wheelchair accessible units. The society’s "More Than a Roof" value-added philosophy aims to build supportive communities where people can heal and create positive change. More Than A Roof is a leader in the field of affordable housing solutions by offering "More Than" through their community development initiatives. One key area continually addressed is poverty reduction. MTR’s Next Step Financial Literacy program offers financial management workshops, a savings program and dollar matching bonuses at the end of the program for those who successfully graduate. Other opportunities for tenants include work experience through volunteering, frequent community activities, support groups, community gardens, kitchen and life skills support. Executive Director Lorne Epp joined More Than A Roof as a volunteer board director in 1992. In 1995 he accepted the official role of Executive Director and has employed his previous 18 years of project management, real estate and development experience to focus on reducing and eliminating all forms of homelessness. Under his leadership More Than A Roof’s portfolio has grown considerably. The society is well respected as a voice of authority in the fight against poverty and homelessness in British Columbia, Canada. Since 1984 More Than A Roof has grown from one community, a staff of one and an annual budget of just under $300,000 to managing a housing portfolio worth $1.1 million and an annual operating budget of $6.5 million in 2012. In 2012 MTR housed over 1,000 men, women and children and was present in 10 communities from northern British Columbia to Vancouver Island. Since 2009 Kindred Place, in the Vancouver neighborhood of Yaletown, has been home to 86 low income individuals. Major funding for operations and housing subsidy is provided through British Columbia Housing, a branch of the provincial government, while Vancouver Coastal Health, another branch of the provincial government, provides valuable health care dollars for mental health and addiction recovery support. As a faith-based housing provider, More Than A Roof values its Mennonite heritage which serves as a spiritual resource and motivation to provide affordable housing for people regardless of their race, religion, age, cultural background or physical capabilities. Michayluk, Lee Anne. "More Than A Roof Mennonite Housing Society." Global Anabaptist Mennonite Encyclopedia Online. 2012. Web. 20 Apr 2019. http://gameo.org/index.php?title=More_Than_A_Roof_Mennonite_Housing_Society&oldid=137117. Michayluk, Lee Anne. (2012). More Than A Roof Mennonite Housing Society. Global Anabaptist Mennonite Encyclopedia Online. Retrieved 20 April 2019, from http://gameo.org/index.php?title=More_Than_A_Roof_Mennonite_Housing_Society&oldid=137117.